Peter Kneale is known by bike fans around the world as 'The Voice of the TT'. 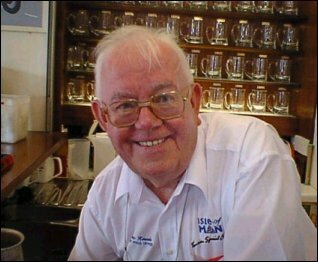 His famous voice has kept TT and Manx Grand Prix fans informed via Manx Radio since their commentaries began. I spoke to him recently from his home in Onchan, where he ironically is one of his fellow commentators, Geoff Cannell MHK's, constituents! OK Peter, first of all, for the purposes of this interview, can I ask you how long you have been involved with the TT? Well I have been involved with Motor Cycle Racing, the TT and the Manx, from the first Manx Grand Prix after the war in 1946 and I've seen every race since. Then when I was sixteen I started marshalling and then in 1963 I was asked if I could go into the time box as an auditor, which I did until 1964. Then at Christmas in 1964, I was asked if I would do some sports news for Manx Radio, which had just been formed, which I did. I used to go up during my lunch hour, read the sports news, and then go back to work. After that I was asked to join them as Sports Editor and as a presenter, which I started doing on the 7th of May 1965 and a month later I was commentating on the TT. Was it just one commentator then? Yes. I was the commentator at the Grandstand but we had people out at Phone boxes phoning times through to us. Strangely enough, the places we picked were Ballacraine, Ballaugh and The Bungalow and the next year they became the commentary positions. So you were the first Manx Radio Commentator then? Yes although they did take a direct feed from the public address the year before. I have to say that it's quite surreal sitting here talking to the man with the voice I only normally hear coming out of the radio? Anyway - about the voice. You are known as 'The Voice of the TT' and have also been sited as the Murray Walker of the bike world. You must be proud of these comparisons? I am yes. I'm very proud. I think I've been very luck that I've had the chance to be involved in a sport I really do love, and be involved in a really big way by being the commentator. All the riders now rely on the information we give out now, and you really become an integral part of the races. You sit there and as soon as the minute board goes, you know what the riders are feeling like, and you feel the same adrenaline pumping your self, until the flag goes and you get into the mode. With it being a kind of time trial, the spectators rely on us also for their enjoyment of the race, so they know who's where on the leader board. Before that, I can remember you had to wait for the Roads Open Car to come round, which had the top three displayed on the back of the car. No it's true. But the whole thing is fantastically well done, with the timekeepers for instance. They are out from the crack of dawn setting everything up and making sure everything works properly. We've got a great team of commentators who all work well together and the back up team is brilliant. A lot of hard work goes into it, but it's still a very simple but efficient method isn't it? The hardest part is the homework you have to do. Riders change teams and change colour helmets, so you have to do a lot of work in Practice Week. And everyone is waiting for you to make a mistake of course? Oh yeah, but I don't think I've made quite as many as Murray Walker (laughs). So moving onto this years TT. Road Racing has had a disastrous year due to the Foot and Mouth epidemic, with the Isle of Man suffering more than anywhere with a clean sweep of all our events falling foul of the disease. What are your views on what has happened? I think in all honesty, and there is no bigger fan of the TT and Manx than myself, for the best interests of the Isle of Man in general it was the only decision they could make. It is unfortunate that they had to go, but if you look at it, if the disease had got onto the Island it wouldn't have just wiped out one farm, it would have wiped out the whole industry. There is talk that a six-month period is required without any cases of foot and mouth before an event like the TT can go ahead. There are still new cases in the UK almost every day at the moment, so what do you reckon is going to happen next year? I think a decision will be made that the TT will go ahead next year. I think it will be bigger and better than ever, because David Jefferies, Ian Lougher and John McGuinness were over on the Island doing something for a new magazine, and they had an egg and spoon race, which I commented on. I talked to them afterwards, and they were all absolutely gutted that it was off, and they all said that they would be back again next year. With the steps that have been taken like offering free entries, increasing the lap money, and the £5000 injection for the winners of each race, I think it will be good. The TT on a whole has taken a lot of stick of late and there are a lot of people who think the future of the TT is pretty bleak. What are your thoughts on this? Well I have magazines like 'The Motor Cycle' and 'Motorcycling' from the late 30's and they have articles in them saying that these races should be stopped, they are far too dangerous and there are people doing speeds of over 90 mph in them. It's had it's troughs and it's waves over the years, in 1975 or 76 when they lost the World Championship, people said that it only had a few years left and that it would be the end but it always bounces back. The main thing is that as long as riders want to come back and compete and every year without fail the entries are over subscribed, and twenty two countries would have been represented this, the fans will always come back and I think the TT's future is sound, and after this one year gap it will bounce back and be bigger and better than ever. It will go on and on, and we look forward to 2007 for the 100th anniversary of the TT. I recently read Jimmy Walkers book about Joey Dunlop and I noticed a quote in there from your self I would like to ask you about. I can't remember exactly what it said but it was along the lines of 'once Joey Dunlop stops coming to the TT, it will be the end of it because he brings so many fans over'. What did you mean there? I think it has possibly been taken slightly out of context. What I would have meant was that I realised how important Joey was to the TT. But before we had Joey there was Stanley Woods, Mike Hailwood, Geoff Duke and so on who have all been true TT stars. When Joey first came along in 1976 he had never been heard of, but all of a sudden he was the man that was on the rise. He did so much for the TT because he was just one of the boys, not a superstar and that's why the fans loved him so much. But the TT will go on, sadly without Joey, but there are other riders coming through now like Adrian Archibald; he's the next star. And there could be somebody else waiting in the wings, who next year could come along and be the next star. There is a lad I know who I'm sure you remember called Martin Finnegan. He lapped at over 111mph on a 250cc machine when he weighed about 15 stone on his first ever meeting on the Mountain Course. He's Twenty-One years of age now and he is one of a rare breed, who actually wants a career racing at the TT. Do you think the Organisers could do something for someone like that? Yes, well that is the sort of rider who really needs to be encouraged and financially well looked after to give them the encouragement to come. I mean to lap at that speed in his first visit is incredible, because most people will say I need to come to the Island at least three times before I even know where I am going. It's great to hear about a rider of that age talking like that about the TT. OK, changing the subject slightly, if you could change anything about the TT what would it be? I would guarantee the weather is always good for a start! I think the organisation of the TT over the last ten years has been brilliant, because there were times over the last fifteen years when the ACU and the Department of Tourism weren't working together as they should be but now with Tony Brown originally and David Cretney, things have changed. David is the Chairman of the organising Committee, and the Chairman of the ACU is the Vice Chairman of the Organising Committee and they really do work as a team. When there was a problem over the dates for the British Superbikes clashing with this years TT. It was this combined effort that sorted it out. So what would I change about the TT? Well I just love the TT so I don't know what I would change. I'm looking forward to the change in the programme for next year with the second 600 Race. So you don't remember the 10 Lap Production Races then? Yeah, they were good but they were too long. The fans started to lose interest in them before the end. It was a gimmick to start with. The thing that will always stay in my memory about that was that at the time there were 70 pairs of riders. So for arguments sake, lets say they were put down in the programme as Alex George and Dave Croxford. So you knew Alex George and you knew Dave Croxford on the bike, but when you got down in the 70's with all respect, you couldn't tell which rider was which. So we asked the late Vernon Cooper who was the Chairman of the ACU, if it would be possible to put an armband on the rider who was named first in the programme so we would know. He agreed it was a good idea and said that he would sort it out and he did but he put it on the right arm of the riders. Now the only commentary place that could be seen was at Ballaugh. All the others - you couldn't see. The following year they put armbands on both arms! It was a marathon race, and it was a marathon for the Commentators. The Manx Grand Prix Newcomers Race has three classes as you know, but it's a four-lap race. If you have three classes in a ten-lap race, it becomes a long day. Back to talking about you for a moment. You can't carry on commentating forever, and I would be interested to know, how long you think you will be commentating for into the future? As long as I feel fit enough, and I can get up into the tower, and Manx Radio still want me to do it, I hope to continue for many years to come because I thoroughly enjoy it. Good. Now I have to ask you about a mistake. Manx Radio's TT Coverage is very professional, but everyone makes mistakes from time to time. What's been the most memorable mistake you can remember through the commentating? The funniest one I can remember is one my wife Brenda pointed out to me when I got home that night. It was the year Charlie Mortimer won, and she said 'Do you know what you said?' 'You said And here comes Charlie Yamaha on his Mortimer to take the chequered flag.' I said 'I wouldn't have said that.' But then when I listened to it back, I had actually said it. And did anyone else pick up on it? Yeah, I got a little bit of stick from one or two people afterwards. Another story I remember from our very first year. The people were out on the circuit and they had the money to phone in the times. There was a tremendous battle between Redman and Hailwood and we were waiting for them to come through and to here from the chap out at Ballacraine. We didn't hear from him, so eventually we phoned him. When we asked him what the difference was, he told us that he had gone to the toilet when they came past and missed them. There are just a few funny things that have happened.. Your are obviously a big TT fan and you have seen many riders over the years. However, there must be one rider who is your all time favourite? That is always a very difficult question because people ask me who I think the best rider has been. What I always do, is take a decade, and think who has been the best rider in that decade. Artie Bell in the 40's for instance, Geoff Duke in the 50's, errrm, if I said who I think was my particular favourite, it would have to be Joey. Not because he won 26 races, but because he never changed. He came over here in 1976 when he had never seen the course. He went out for practice and just followed riders round to learn the way. He went on to win two replicas in his first year. Then he went on to become a works Honda rider, and he didn't change at all. One example of this is when I was trying to get pictures for the results book we put out. At the TT you find the majority of riders have their mechanics to put the bikes through scruteneering, which is fine. But I was there this night, and out comes a little fella with a little 125 bike putting his own bike through scrutinizing. He was a superstar as far as the TT was concerned, but he was still doing it all himself. I asked him for a picture, and as usual there was no problem. He's certainly been the greatest Road Racer we have ever seen, but because of his personality, and the way he always just wanted to be one of the boys, for me he was the best. You are part of a TT Race yourself, but what I would like to know, if there is a race that sticks out in your mind as being the best? There's a couple actually. The first one I remember is the 1967 Senior between Ago and Mike Hailwood. The part I remember was coming into the pits, because when Hailwood came in, you could hear him shouting 'Hammer, hammer!' because the twist grip was hanging off, and he was wanting to bang it back on. He admitted it afterwards that if Agostini had of kept going that he would have won, because of the Twist grip problem. But in 1973 I jumped up and down the most during a race, when Tommy Robb, who I had become to know very well, and is still a good friend, and who had finished every position from 10th to 2nd but had never quite won, won his first run. Charles Mortimer was riding a Yamaha but he had a crash before the TT, and couldn't ride the 125, so he gave it to Tommy to ride. He set off, and set the fastest lap of the race on the first lap, and said that he slowed down so as many riders as possible could get replicas. Only two didn't. I remember when he came to cross the line, I just blurted out, and which he quoted in his book, 'I don't care if you think I'm biased towards Tommy, because he's a mate of mine!' and I was on my feet shaking my fist. So I suppose that was the most emotional I ever got. The other I suppose, was between Joey and Robert, together in the pits after Joey had finally beaten Mike Hailwood's record. The final memory I have of Joey last year, after we had finished the broadcast, in the press office, and there was Joey was there and he was the first person I saw. I congratulated him for doing his fastest ever lap on the last lap of the race at 123.87mph, and I said 'Gosh Joey that was pretty quick'. And he just shrugged his shoulders and said 'Aye it felt pretty quick'. But he was just stood there and he looked so well, and a happy and contented man at what he had done and that is the memory I have of him. (Laughs) Well as long as you're happy with that Paul. It's lovely to meet you. No that's fine if we do any more, it'll take me too long to type it all up!! Great, well I'm happy to help anytime.